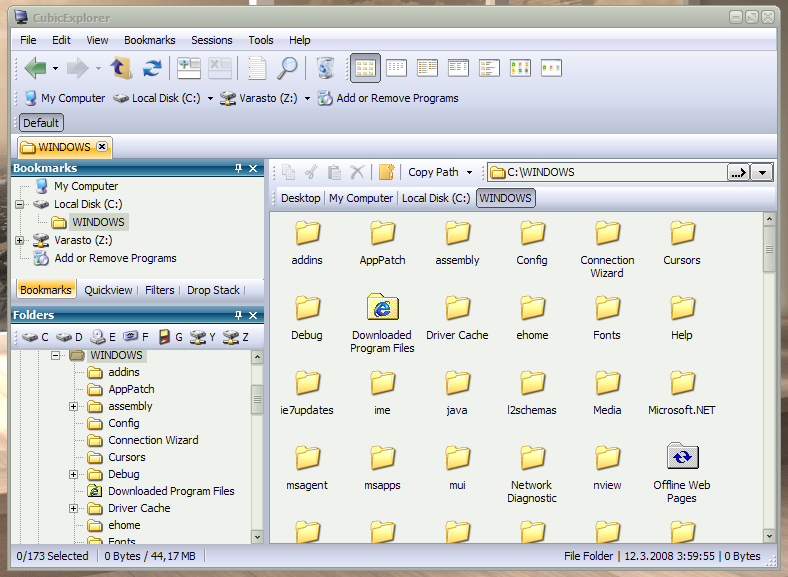 CubicExplorer is a file manager/browser software. It's designed to be easy to use yet powerful to handle multiple directories at the same time. It uses tabbed browsing and bookmarks. It also has a build-in text editor which has highlighters for many different file types. Very nice free explorer. Does everything I need so far. I've been disappointed by Q-Dir (tiny icons and refreshing problems) and Explorer++ (instability). This one has not disappointed me so far. Hope the Dev keeps it going, it could just a tad more improvements. The context menu does not show a complete list, eg. "Open with 7zip", "Scan with MalwareBytes", etc. It's a deal killer. The Dev. really should offer an X64 version. Very nice start. This is one of the few file managers that actually implements shell folders and shell items... which I consider crucial to any Explorer clone. I only have one or two gripes (text editor isn't integrated enough) and I can't wait for new versions. While I am not prepared to give up XYplorer (http://fileforum.betanew...l/XYplorer/1011575143/1) just yet, I have to say that this is a fairly impressive little file manager. While not as robust as some of the others on the market (XYplorer, xplorer2, Total Commander and the massive Directory Opus, to name a few), it also certainly can't be accued of being "bloated." I particularly like the breadcrumb interface, and the nesting of controlbars within the file tab. Total commander ! The best ! Very nice freeware alternative, but SpeedCommander sounds a lot better. Very nice file manager with a few exceptions. When the system is under any relatively high load, this program's responsiveness becomes very poor. Shift+Delete doesn't work for bypassing the recycle bin. Those are my only two big gripes, aside from that it could just use several tweaks to the UI, mainly the way the bookmarks pane works. what ? the ftp version of windows explorer ?. I much prefer list view in a classic pane than use an explorer window EVER. I could easily have 2, 3, or more folders open & tiled without needing this whatsoever. I use Directory Opus anyways. The program is coming along nicely. My main wish is that the tabs could be made semi-permanent, or "lockable" When clicking folders, the tabs change like crazy. Why even have tabs if that's the way they are going to work? It's just as easy to use the folder tree like Windows Explorer as to use tabs that can't be locked. "displaying sizes of subdirs is actually done pretty well in xplorer2, but it's only available in the paid version and I dont know about you, but I like free stuff! It's not a show stopper if it never comes to this app, but I can dream can't I?" You can do this in CubicExplorer. You will not get a graphical presentation, but you can see the size of any folder (with subfolders). What you have to do is to download and install a small, free program called Folder Size. You can easily toggle it's function on and off, so there is no need to worry about CE becoming slow. How to use and install is described in detail in the latest Help file for CE (downloadable from homepage). "And finally...it'd be great if we could select additional locations/icons for the drives toolbar, rather than needing a bulky bookmarks panel. Think Firefox, not Opera. ;)"
I've been a PowerDesk user for years and have always like it, but thought it could be better. CubicExplorer seems like it has great potential and I'm impressed with what I've seen to-date. 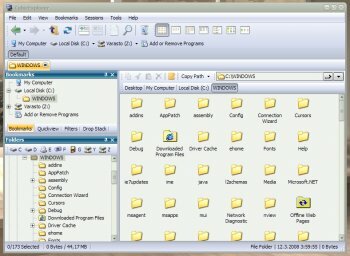 One thng I would like to have as an option is to set my default folder when the program opens without having to use the Option to Remember Tabs On Exit. Ths option brings you back to the last folder that was open. I *always* want to open to a specific folder, which happens to be my default download location, and navigate from there. Most times I want to do something in this folder. Other than that I like the program, so kudos to the programmer; I look forward to future releases. This version gets 5 because it's the best file manager I've found, but that doesn't mean there isn't a lot of room for improvement by nitpickers such as myself. Lots of improvements in this one, though still not *fully* customizable. I can't seem to attach the Up/Refresh buttons to the left of the tab list, and I can't get rid of the Copy/Cut/Paste bar. It'd also be nice if it didn't auto-refresh like a spaz and unload all the icons every time you change folders or perform an operation on a file. I'd like to have the option to link tabs to the X button on the top-right of the window. This is a fatal flaw IMHO of how all tabbed interfaces work - you can't *quickly* exit a tab. Another request is the ability to link another program to searches(when the F3 key is pressed). For file searches, there is no better file indexer or searcher than Locate. When searching for an IM log file, CubicExplorer and Windows failed to find it and took quite a while to check my entire computer. Locate took < 0.5s, and found every file possibly related by name to the logfile, including a backup I had accidentally stored on a USB memory stick. Aside from my nitpicks, great work! I've used PowerDesk for years but after 2 days of using CubicExplorer I'll never look back. tacc - displaying sizes of subdirs is actually done pretty well in xplorer2, but it's only available in the paid version and I dont know about you, but I like free stuff! It's not a show stopper if it never comes to this app, but I can dream can't I? really enjoying cubic explorer and they even added another small feature request of mine to the very next version after I submitted it! yay, it's pretty cool, especially for a freeware. and just a small answer to forgie who says "one thing i'd like to see added is the ability to view the size of subdirectories"
> this wouldn't be a good idea : this sort of operation takes a -LOT- of time. Because unless operating from a completely DB-ed filesystem (and FAT/NTFS is not), the proggie would have to recursively parse directories to calculate their size. In fact, it has been added as an option in some similar software and it makes browsing just unusable.